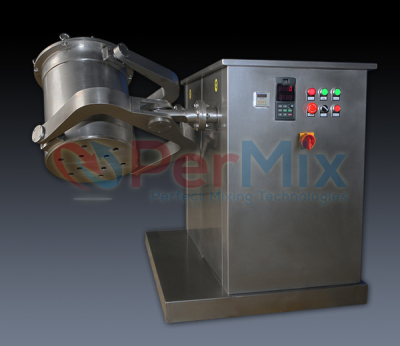 The PerMix PTU series 3D Mixer is used for homogeneous mixing of powdery substances with different specific weights and particle sizes. Producing dry-to-wet and wet-to-wet mixtures is also possible. The production process is hygienic and dust-free because the product is mixed in independent containers of variable sizes. During the mixing process the powder moves on a random direction from center to the end of the trough and on the same time from top to the bottom. In such a multi-dimensional way, the PerMix PTU series 3D Mixer needs only short mixing time and relatively low power consumption. 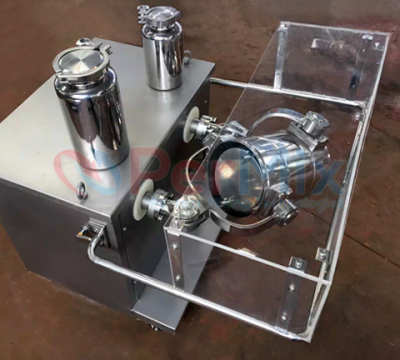 The mixer's "Gentle" mixing action is good for final products that are sensitive to high shear of the mixer and tend to break or to reduce their particles size, or are highly abrasive. We are able to offer our PTU Mixers with contact part to be built in SS304, SS316/316L, Titanium, Duplex stainless steel, Hastelloy, etc. Standard of internal and external finish can be adapted to the customer's needs. Mixing in independent containers (on small models) offers no contamination and emissions, no extra cleaning. Safety cage to prevent human injury. Time-saving, fast exchange of the container, due to simple and fast mounting of the container.